Enjoy playing Massenet's Meditation from Thais accompanied by concert pianist, Lisa Maresch. Thanks to our unique interactive video player, you can easily speed up and slow down the tempo of the piano accompaniment audio/video track, set up loops and markings - all while reading your violin part from the same video. A useful tool for any musician. I was especially pleased to obtain this music as i was recently asked to play Meditation by Massenet during a home recital. Having the piano accompaniment available with adjusted speeds was wonderful - a major help while learning to play it. 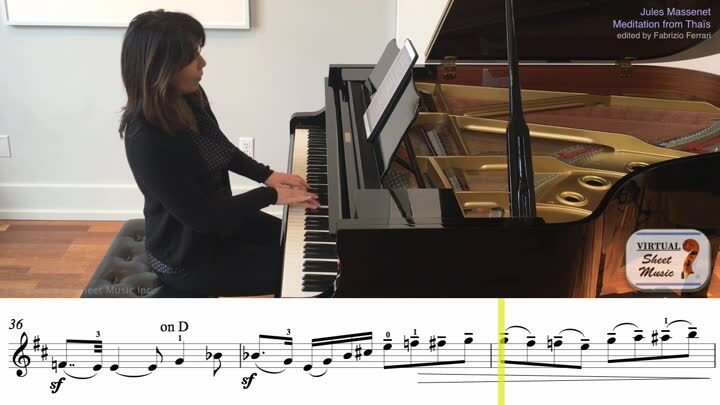 This is a great way to learn this beautiful piece. Particularly helpful for me was the ability to loop sections while practicing them.